I launched my first blog in 2012. On the outside, I told people that it was a hobby, but on the inside, I hoped it would make money. I devoted hours each day to the blog (this was before I had kids…haha!). And my husband knew I was working hard and that I hoped to earn some money. “When are you going to make a blog business plan?” he asked me, about three months into my blogging adventure. Then he outlined all the reasons why I needed a business plan, and my eyes glazed over. And THAT got my attention. But only for a minute. I was stubborn and maybe a little bit scared that I didn’t have what it takes to monetize my blog. So I never did write that business plan. And what do you know? My blog never turned into a business. Fast forward 4 years, and 1 failed blog later, and I was ready to try again. I spent a month researching and creating a business plan for this site before I launched. And that, my friend, has made all the difference. As you’ve probably experienced, creating a blog business plan is hard. It forces you to take a cold, hard look at reality. Do you have a niche? Do you have a strategy for monetizing? Are you selling a product that people want to buy? Or do you just have an expensive and time-consuming hobby? Creating a blog business plan is also intimidating. I remember thinking, “Aren’t business plans just for big corporations, not for little old me?”Just the phrase “business plan,” felt so out of touch, so stuffy, so scary to me. If you’re feeling the same way, read on. You need to see the big picture if you want to turn your blog into a business. It’s so easy to get bogged down in the day to day hustle. You get stuck in the churn of writing new blog posts and promoting on social media. But if you want to make real money, quit-your-day-job money, you need a plan. With a blog business plan, you’ll be able to plot a path to reach your goals. Want to make a full-time income from your blog? Awesome! Your business plan is going to help you get there. Many of the bloggers I know neglect this long-range planning. The result? They never get any closer to their goals, and they lose the motivation to keep trying. Why do traditional businesses create a business plan? Well, one reason is that they need money. The business owner must prove profitability, otherwise no one would invest in it. Guess what? Even though you’re not asking for a loan to run your blogging business, you still need a business plan.You’re investing your own personal money and more importantly, your time. If you can’t prove to yourself that your blog will turn a profit, then why bother working on it? As my husband so eloquently put it, “Then, it’s just an expensive hobby. If you’re a solo business owner, you need a business plan to help you stay accountable. The good news is, your plan doesn’t need to be as long or robust as a business plan for a big business. In fact, I recommend that you keep it short and sweet. If you’re anything like me, you’ll be more likely to complete it if it’s short. 🙂 Plus, keeping it short forces you to prioritize and clarify. I like to include the following key components in my business plan: mission statement, target audience, top goal for the year, revenue streams, and a basic marketing plan. These pieces fit perfectly on a single page, which I hang above my desk so I can look at it regularly. If you’d like to use my template, you can grab it here. You have a blog business plan. Now what? Your blog business plan should be a living document. Ideally, it’s something you look at regularly and revise throughout the year. It’s also the foundation for your planning. When I plan out my week or my month, I review my business plan to make sure I’m tracking to reach my goals. For example, when I’m planning my editorial calendar, I make sure that each post moves me closer to my goal. I’ll write a review post, like this one, to help me boost my affiliate income. Other posts, like this one, are designed to help me sell my products. As a solo business owner, you’re responsible for day-to-day operations and for the big picture. But it can be too easy to get stuck in the day-to-day and forget about the big picture. 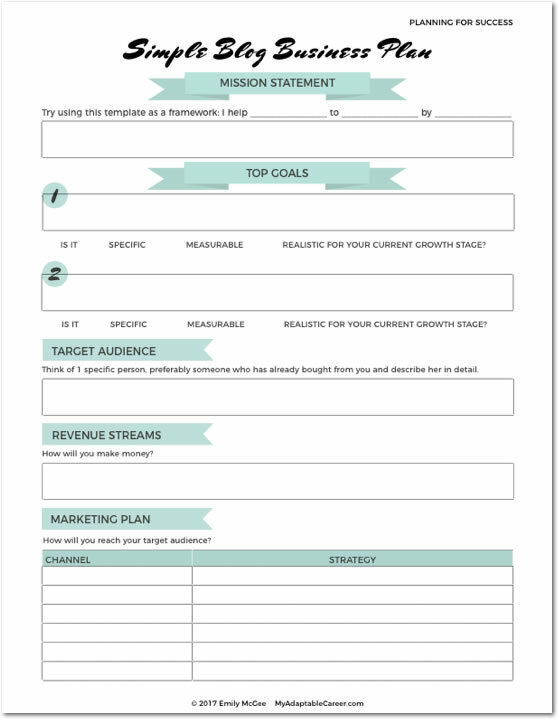 If you don’t have a blog business plan yet, download my template and fill it out. It will take you less than an hour, and you’ll be amazed at the clarity and confidence you’ll get by completing it. 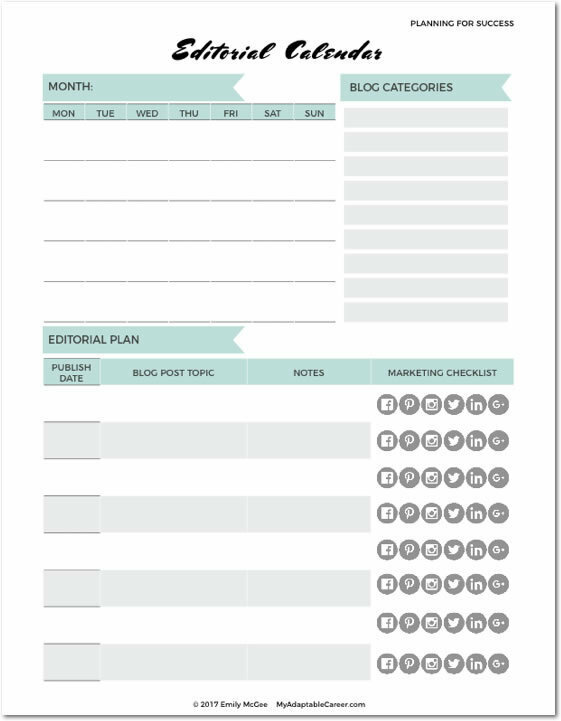 Do you have a business plan for your blog? What’s been stopping you from creating one? Leave a comment, I’d love to hear from you! Exactly what I was looking for. You are right, it’s so easy to get caught up in the day to day stuff! I definitely need to create a business plan. This is a great post. Thanks for the information. Thanks for sharing with us the business template! Certainly! Thanks for stopping by, and I hope you find it useful!